Cheryl Rux and Nichole Vandever are the most resourceful of artists. Putting a spin on the old saw, “When life gives you lemons, make lemonade,” when life handed them more than 1,500 cardboard toilet paper tubes, they made them the groundwork for a fantasy “park” for Spaceworks Tacoma. 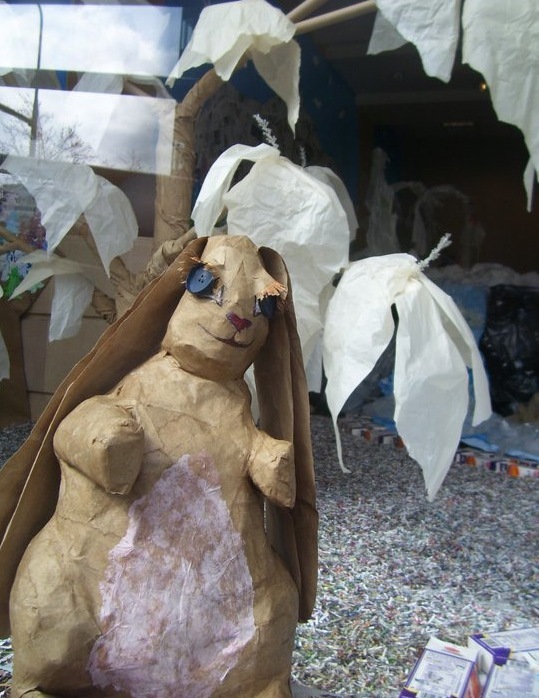 Inside the large display window at the corner of 11th & Pacific Avenue, Watch Tacoma Grow: Pacific Park is a mini-wonderland where wide-eyed woodland creatures, birds and bees and flowering trees inhabit a contemporary landscape of I-wish: all made from reclaimed and recycled materials. For this ambitious project the founders of Smash Hit Productions, who are best known for their one-of-a-kind piñatas, decided to enlist help from kids at local grade schools: Fern Hill Elementary, St. Charles Borromeo School, North Tacoma Cooperative Preschool, Lowell Elementary and Grant Elementary. According to Vandever, they wanted the recycling concept to highlight the challenges that the school system, arts organizations and the parks system all face in a time of diminishing budgets. “We want the children to be proud of something in their city that they helped with. It’s important to build a sense of community and to emphasize the importance of the arts at a younger age,” she says. And there were practical considerations, says Rux: “Nichole and I were going to fill the space ourselves, and then we realized the space was a lot larger than we thought. Most of our friends don’t want to glue hundreds of flowers and leaves together, but little hands need to stay busy, so we decided to get the kids involved.” The project was a perfect fit for both artists and kids, who collected reclaimed materials such as milk containers, paper bags, packing peanuts, PVC pipe, and more. 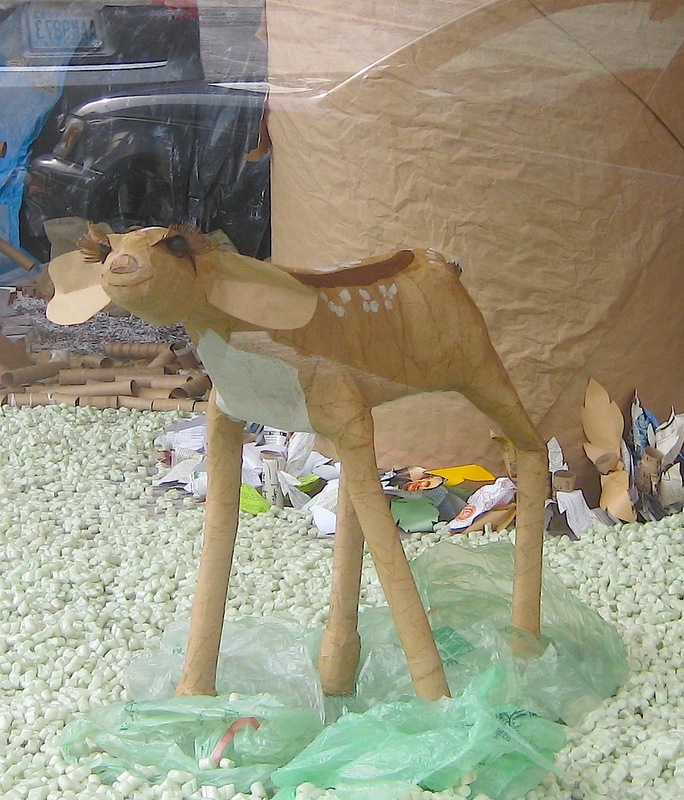 Papier-mâché fawn by Nichole Vandever. Young visitors will enjoy spotting creatures such as a knobby-kneed fawn, a porcupine and a flop-eared rabbit in the window; a pagoda and a stream with a footbridge. “We have really embraced the use of recycled materials in our art,” says Rux. “The materials are free, in some cases abundant, and they stir the creative juices. Everything you use can be transformed into something else – you just have to figure out what you want to transform it into.” Watch Tacoma Grow: Pacific Park is dedicated in loving memory of Sunni Vandever, Pat McGhee, Kevin Vandever and William Rux. 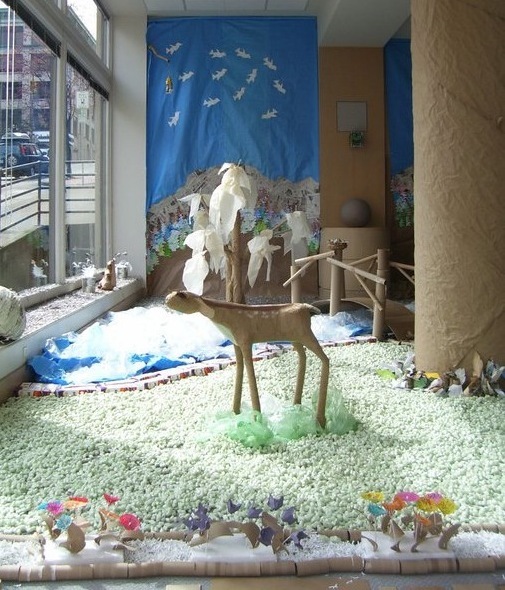 950 Pacific Avenue through July 1, 2011. Call for Artists – 8@8!